– for some mild action and rude humor. Disney had originally planned to release a straight-to-DVD Cars spin-off that would be entirely centered around vehicles of the sky. However, after early footage tested well with the studio, a full-blown theatrical release was then set for August 2013, giving Planes a new set of wings and a chance to soar to greater heights. This is the first blatant association to a Pixar project that wasn’t made by Pixar, but casual moviegoers wouldn’t notice the difference. 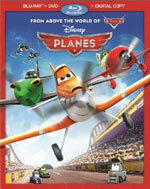 While little about Planes is particularly original, as it’s rife with familiarity, the movie is a highly enjoyable one. Racing is the topic yet again, but this time the characters take to the sky. Dusty Crophopper is a crop dusting plane with racing skills and aspirations to race, but he’s just plain not built for such a sport. This doesn’t stop him from trying, however, and our underdog hero enters a competition to try to get into the big race, which obviously he does. His best buddy is a fuel truck named Chug while a forklift named Dottie often helps Dusty from a technical and medical side. Comedic actor Brad Garrett voices Chug as a slow-witted but lovable character. While he thankfully does not give the character a redneck, backwoods sound, I realized shortly into the movie that he was basically the “Mater” of Planes to Dusty’s “Lightning McQueen.” If anything, Disney’s created a “bizarro” world of Cars where other characters stand in for popular Cars counterparts. Dusty is a sweeter, more humble and determined hero and underdog, while Lightning McQueen started out as a real selfish jerk who had the skills but needed a lesson in humility before becoming the hero. Mater is dumb as dirt and would accidentally make trouble for Lightning while sounding as if he misunderstood the most common things. Chug and Dusty have been friends for a long time and, while still goofy in nature, Chug is more capable than Mater. So while it’s pretty obvious they were looking to a successful formula on which to base a potential new franchise on, it still felt different enough not to be copying the story of Cars TOO much. The story, again, isn’t exactly a new tale, but the planes that fill it are largely likable and fun to watch. The voice cast does a great job, including standup comedian Dane Cook as Dusty, Teri Hatcher as Dottie, Sinbad as Roper, Stacy Keach as Skipper (who plays a mentor role to Dusty like Doc did for McQueen), John Cleese as a British plane named Bulldog, and Julia Louis-Dreyfus is unrecognizable as a French-speaking plane named Rochelle (and any diehard Seinfeld fans may find great humor in that particular character name choice for Julia to play). Some other great voice actors round out the mix, but so many come and go during the movie, you’re not likely to recognize them all. The content for the movie is pretty tame, but violence is really the only red flag. Some of the things that happen to Dusty could be a little harrowing for young viewers, but there’s nothing particularly horrific. We do see a wartime flashback, though, that shows many planes getting shot down from the sky. It’s meant to be dramatic, but it’s a very brief scene. Otherwise, it’s a very kid friendly movie. My almost-three-year-old loved it and didn’t seem to be scared by anything in it. While it may lack an original story, the design of the world of Planes is otherwise rather clever and humorous. Kids are likely to be the most forgiving of the film, however, given that they won’t have seen as many movies to compare it to as their accompanying adults probably have. If you’re not frequently reminded of other race-themed films (some of the finale may even be reminiscent in appearance to the pod racing in Star Wars: Episode I – The Phantom Menace), the overall underdog theme or feel of the movie should bring to mind other Disney or Pixar outings. But, by film’s end, Planes is still just a fun, visually stunning, and rather enjoyable 91 minutes. Parents and kids alike could certainly do a lot worse than Planes; it’s a decent and entertaining animated film for the whole family. 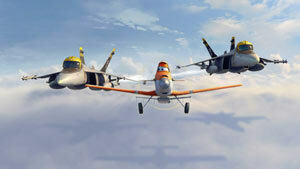 Disney is releasing Planes as a 3D Blu-Ray/2D Blu-Ray/DVD/Digital Copy 3-disc combo pack, a 2-disc 2D Blu-Ray/DVD/Digital Copy and a single disc DVD with a Digital Copy. I did see Planes in the theater and have revisited it a couple times now in HD with my 3-year-old son who really enjoys the film. He’s even asked to watch it again right after viewing it. As an adult, I can see how the plot isn’t the most unique, but it’s evident that a lot of time and attention to detail was put into making Planes and I really think it shows. The animation is fantastic too. One can certainly do much worse than Planes for entertainment. 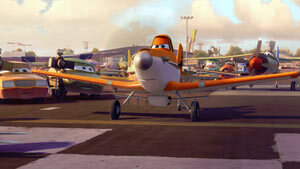 But hey, if you like Cars, Planes is an enjoyable effort. Exclusive Musical Scene: Franz’s Song (3:18) – Instead of a new animated short, Disney has completed a deleted scene to include here as a little bonus. It starts with an introduction from director Klay Hall and producer Traci Balthazor-Flynn who explain how the song was cut from the film because they deemed it unnecessary to keep in, but they liked it enough to have it be totally completed for the Blu-Ray release. The song serves as a sort of “drinking song” that Franz sings in the bar to Dusty to encourage him that if other vehicles can do things that they’re not built to do, “then a crop duster can race.” It’s actually a pretty funny and cute moment that may have been fun to leave in the finished film. Klay’s Flight Plan (15:31) is a making-of featurette that explains how the movie came to be. Pixar’s John Lasseter tells how it was his idea to explore the world of Cars to start telling the stories of other characters in the same universe as Cars. Klay Hall had been developing a film about trains that would have them exist in the same world as humans when Lasseter called him and asked him if he’d be interested in heading up Planes instead. Hall actually has a family history with flying planes in the military, so the idea of a project like this was a dream come true for him. This featurette is mostly hosted by Hall himself who takes a look at some military planes and the planes in the film, along with his two sons, Jack and Luke. One of Hall’s sons asks if there were any nods to his fighter pilot father in Planes and Hall reveals that his dad was in the Jolly Rogers Squadron and his name was Riley, so it inspired the Jolly Wrenches Squadron and the character Skipper Riley. While Planes, quite honestly, has always looked like nothign more than a ploy of Disney’s to sell more Cars-type toys–but with planes, this featurette really makes the project look like a sincere labor of love. And I think it’s evident by the way Hall talks that it really was for him. Deleted Scenes (8:10) – There are two deleted scenes and an intro from Hall and Balthazor-Flynn that are all playable separately or via a Play All option. After the intro explaining why these scenes were cut, they also introduce each individual scene. First is “Training Montage,” which the director and producer explain was omitted because they’d come up with ideas that they later realized weren’t logical training techiniques for a plane, so they trashed them and went with what you see in the finished film. So here, we see some animated storyboard footage of the original scene idea that included Dusty dodging wrenches and trying to pull Chug while he’s driving in the opposite direction. The second scene, “Taj Mahal,” was inspired by Lady and the Tramp. Originally, Hall pictured the courtship scene between Dusty and Ishani to be them flying around the Taj Mahal a couple times, but he found it to be too monotonous and boring, so they scrapped it for the more scenic alternate version in the film. Here we see the original idea in pre-vis quality, unfinished animation. 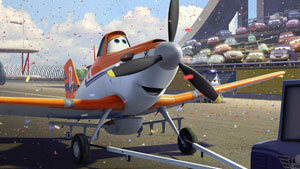 Meet the Racers is a series of promo videos, with a Play All option, for four of the planes in the movie. They’re short little profiles on the character with unique animation not seen in the movie. Characters include El Chu (1:17), Ripslinger (1:17), Dusty (1:32) — where Chug gives him the wrong fuel and he flies out of control, and Ishani (1:32), who is presented as a sort of music video. The only thing that really seemed to be missing was a featurette about the voice cast, but overall it’s a decent collection of extras for fans of the film. And they did decide to include a new teaser trailer for the 2014 Planes sequel that sees Dusty working as a rescue vehicle. Alcohol/Drugs: We see some sports bar settings and characters frequently drinking fuel out of fuel cans in the same way humans drink alcohol in bars; We hear that a plane was disqualified from a race for using illegal enhancing performance fuel. Violence: Most of the violence is animated plane-related violence and non-lethal, but there is one rough wartime flashback that shows a group of military planes being shot down. Dramatic music plays as Skipper recalls the story and we see footage of them being shot down; A plane clips the antenna off of Dusty; We see a plane get damaged during a race and start spewing black smoke; Bulldog’s eyes get blinded by oil and he can’t see and starts to lose control. Dusty then helps guide him to safety; A plane crashes into the ocean and the impact rumples his body. He screams for help and is found/rescued. We later see him with a damaged plane body, bent propeller, broken tail, etc; We see parts of a TV program that illustrates the greatest plane crashes of all time; A plane races through a train tunnel toward a train. Just before it escapes or collides with the train, the screen goes white and we see the plane has made it to a peaceful place. He asks if he’s dead and he’s told he is not; Dottie smacks Dusty with a wrench repeatedly for not listening; Dottie pretends to fall over and die, albeit plafully; A plane tries to damage another plane but the victim is aided by a war plane that then fights with the villain (not with bullets, just with their plane bodies and flying around). Two other planes chase the victim and eventually get stuck together in a small space between two cliffs; And there’s other cartoony violence.